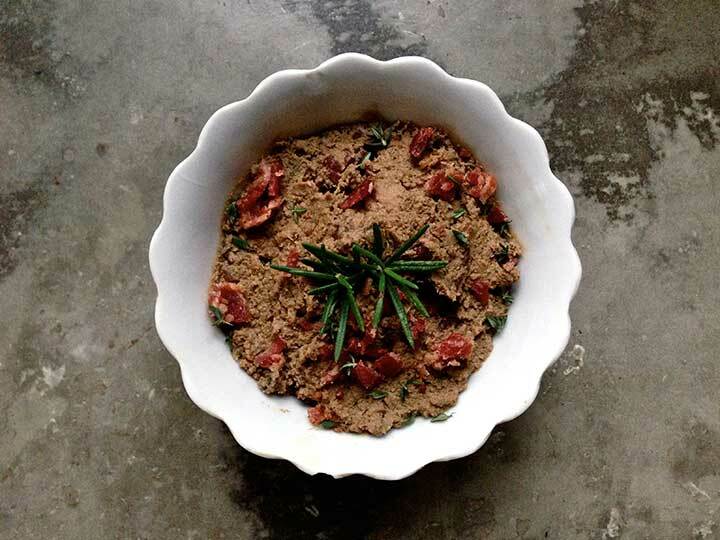 Just in time for Holiday get togethers, I get to share this YUMMY pate recipe with you!! P.S. how do you make fancy accents over the word pate??!! More about the cookbook below, here’s the recipe! Add the onions and cook on medium-high heat for about 5 minutes, stirring. Add the garlic and cook for a minute, 5 minutes per side, or until the liver is no longer pink in the center. Set aside to cool for a few minutes. Transfer the mixture into a blender of food processor with the coconut oil and sea salt. Process until if forms a thick paste. Storage: Keep in the refrigerator for several days. Also freezes well. Note: This recipe is difficult to make in a standard blender; you really need a high-powered machine with a tamper for best results. Alternately you could use a food processor. I think this device is the BEST for this kind of stuff. But I think this might be one of the best AIP lifestyle books. The majority of the book isn’t just recipes and general “stress reduction” tips. It’s an amazing compilation of plans, advice, and empathetic anecdotes that will help those of you with autoimmune issues really find holistic well-being. It truly is a DIY guide to living well with chronic illness and I highly recommend it. Find it on Amazon here. Where will you make this pate? How do you find holistic well-being in your life? So many excellent cookbooks are coming out these days! It seems like every time I turnaround, one of the amazing recipe bloggers I follow is publishing a book. And somehow they always seem to come up with new and amazing recipes to share with you all! So today I bring you a brand new recipe from the brand new book Lexi’s Clean Kitchen. 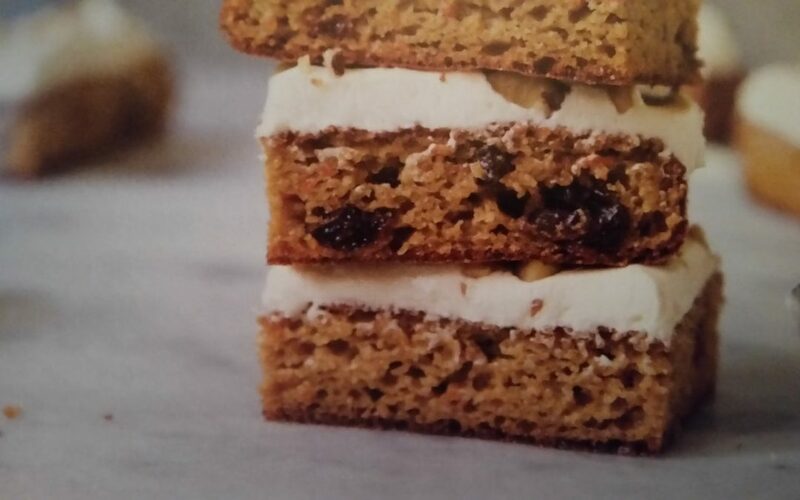 More about the book below, but I think these carrot cake bars will speak for themselves! Preheat the oven to 350 F and line an 8-inch square baking dish with parchment paper. In a bowl, whisk together the almond flour, coconut sugar, baking powder, baking soda, cinnamon, and salt until well blended. Whisk in the eggs , applesauce, vanilla and ginger, if using, until smooth. Store the bars in a closed container in the refrigerator for up to 5 days. I’m so psyched this book is coming out because it has so much to offer. What I like best is that these recipes are clean (or have simple modifications), meaning that they come dairy-free, grain-free, soy and refined-sugar free. That seems like a given but I’m finding that fewer and fewer books take that approach. I’m ALL for a little fudging now and then (you guys know I eat gluten sometimes!) but I like to have the majority of my meals be purposefully simple and filled with healthful, not harmful ingredients. That helps me feel good, look good, and all around ROCK it. I can trust that every recipe in this book can be customized to be gentle on me, my digestive system, and my health in general and that’s something I really love. Lexi’s Clean Kitchen Cookbook comes with 150 recipes including many breakfast, main dishes, soups and salads, side dishes, appetizers, basic recipes, sweets, and beverages. Step by step instructions are included and full color photos for each recipe. An allergy and special diet set of labels is included for dairy-free, egg-free, nut-free, vegan, and paleo-friendly to help you easily navigate within your own personal dietary restrictions. Plus it comes with a guide to clean eating, conversion charts, cheat sheet guides and more! Find the book on Amazon here and support the great work of the woman who gave us this AWESOME recipe. Today I’m reviewing the GREAT Well Fed Weeknights, Melissa Joulwan’s newest cookbook. The main thing I hate about eating paleo is the pure and total inconvenience of cooking my meals. With so much going on in my life -being a student, being a dancer, blogging, working on a podcast, etc- trying to fit in time for healthy, home cooked food is really tough. I know many of you struggle with that as well. I know many of you have much busier lives than even I do. You’ve got school. You’ve got kids. You’ve got extremely demanding jobs. Because, if I’m being truly honest, most of the time I’m not cooking an actual, balanced meal. Most of the time, I’m opening a can of wild-caught salmon and plopping it on top of some greens. I review a lot of cookbooks and I always test out the recipes. They are good, delicious, excellent recipes, too. But the reality is that many of those recipes just aren’t practical for me personally. And that’s why I get so psyched when cookbooks come out that truly speak to my heart. Other cookbooks I’ve reviewed will sit prettily on my counter. I might pull them out on weekends or holidays or special occasions. But mostly, they end up collecting dust while I scarf down an Epic bar. Melissa Joulwan’s new book, Wellfed Weeknights, is a cookbook after my own heart. It’s a workhorse cookbook that you’ll use again and again. Because every SINGLE recipe takes under 45 minutes to prepare (many of them less). 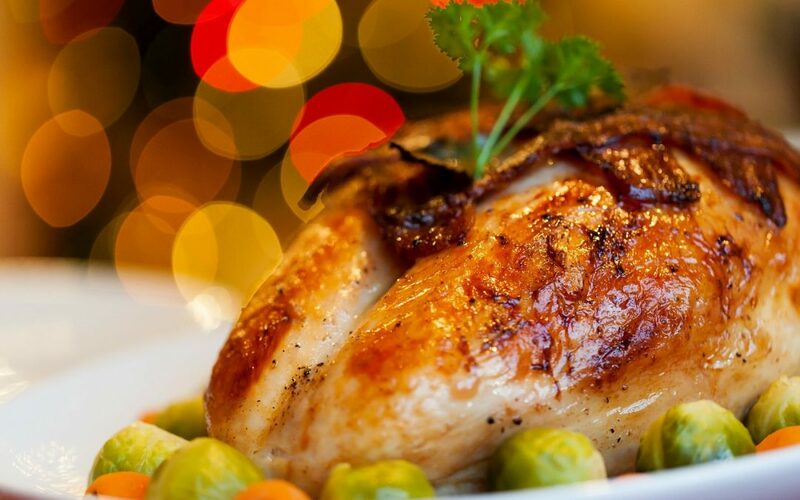 And because she helps you come up with ways to be creative about food prep that mean more leftovers and less cooking, without sacrificing on enjoyment. There’s about a hundred ways to make a hamburger or hot dog (I’m exaggerating, but you get the point!) so that you can cook less and still eat something that feels different every night. Greek burgers, Californian burgers, Hawaiian burgers, breakfast burgers, there’s something for every mood. There are ethnic dishes and classic American dishes. And there are ways to add to your meal for fancier nights when you might want some fries with that. What I love about this book is what I love about all of Melissa Joulwan’s work. It’s a no-nonsense, good eating, practical cookbook that will help you not only figure out what to cook tonight, but help make you more creative so that you can start coming up with your own recipes. I’ve lived off of Melissa’s first book Well Fed for a long time and I couldn’t be more excited for this one. I’ll stop gushing now and just tell you how you can find it! Well Fed Weeknights is available for pre-order and comes out on November 1st. Find it on Amazon here. What do you love about Melissa’s books? Are you excited for this one? How do you fit paleo cooking into a busy schedule? Guys, your favorite Paleo book is updated and expanded. Remember the INCREDIBLE Practical Paleo? It was Diane Sanfilippo of Balanced Bites’ seminal work, combining the brilliance of her recipe making with her intelligence and skill in meal planning. Practical Paleo contained hundreds of recipes and several 30 day meal plans to help you make the transition to paleo easy, simple and delicious. Well, Diane has updated Practical Paleo with tons of new recipes and information in a fabulous 2nd edition! Yay! I’ll tell you more about it in a minute, but first, you’ve got to try one of the NEW recipes from the book. It’s an AMAZING, egg-free breakfast option and it’s already a favorite of mine! Heat a large skillet over medium heat. Add the pork, season with the Italian Blend and stir to incorporate. Cook the meat for 5 minutes, stirring to break it up with a spatula as it cooks then add the kale. Continue cooking for another 5 to 7 minutes until the kale begins to wilt and the meat is cooked through. Remove the pork and kale from the skilled and set aside. 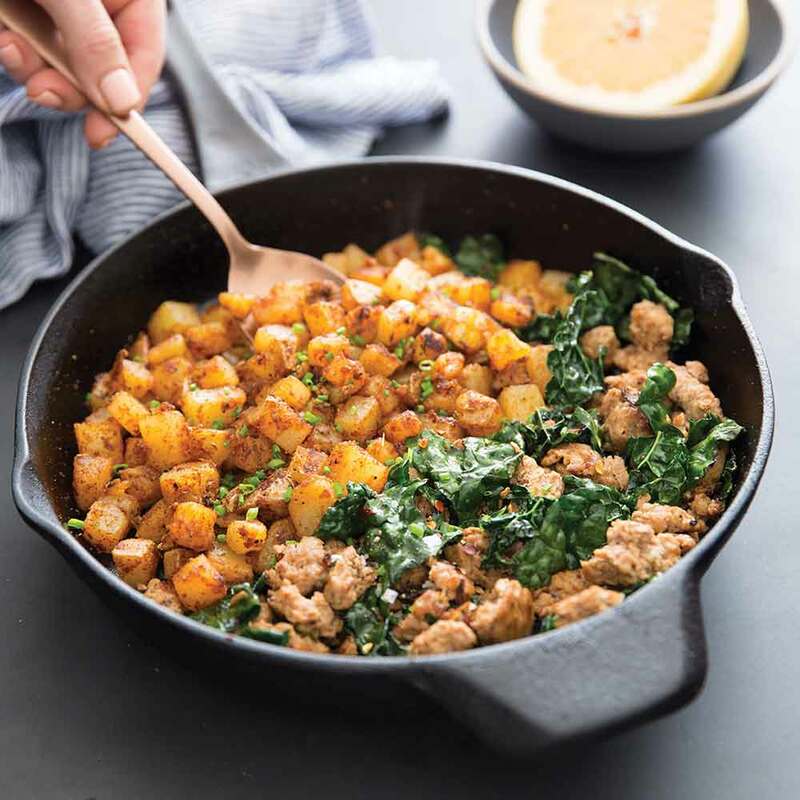 Melt the ghee in the skillet, still over medium heat, then add the potatoes and Diner Blend, gently stirring to coat the potatoes with the fat and spices. Spread the potatoes into an even layer and cook for 2 to 4 minutes, until they start to brown. Stir midway through cooking so they don’t stick. If they do start to stick, add a little more ghee to the pan. Return the meat and kale to the pan, then garnish with red pepper flakes, coarse sea salt, and chives, if desired. So what’s so great about the new Practical Paleo? Well first, the thing is 480 pages long with 2 BRAND NEW chapters that cover the big hot topics that have come up since the first edition came out. Most importantly for YOU is that there are now chapters on Adrenal Health/Stress Management, Healthy Hormones, and Liver Detox Support! Those are 3 very important fertility related topics! There are new photos, a hard cover, and even new labels to help you find which recipes fit with designations like Quick & Easy, 21 DSD-friendly, Freezer Family, Great for Parties, and more. This book just came out so it’s in HUGE demand! You can find it on Amazon here. It’s almost like a totally new book with all the new information and it still makes Paleo easy and practical. You can simply and conveniently dial down on issues in your health that are important to you. AND it makes an AWESOME gift for your friends who have always thought of going paleo but never had the courage. Find Practical Paleo Updated & Revised Edition here. A wonderful new cookbook called Fed & Fit by the excellent Cassy Joy Garcia has just hit the market and it’s AMAZING. And in celebration, Cassy has let us share her wonderful Eggplant Lasagna recipe from the new book! It’s yummy, and yes, it takes some time. But the results are SO worth it. 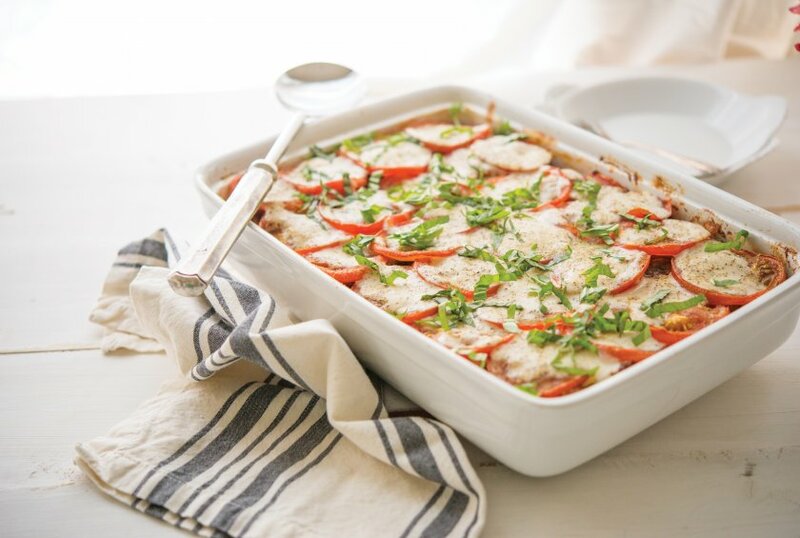 This is a creamy, delicious take on Eggplant Lasagna that will ensure you hardly notice the lack of cheese. I’ll tell you all about the book in a minute, but first, the lasagna! To make the red sauce: melt the tablespoon of butter in a large pot over medium heat. Add the onion and cook until translucent, about 10 minutes, then add the garlic and cook for 2 more minutes until fragrant. Empty the onion and garlic mixture into a bowl. Add the sausage to the pot, break it up with a spoon and cook over high heat until the sausage starts to crisp, about 10 minutes. Drain the fat by pouring the sausage into a colander, then return meat to the pot. Return the onion and garlic mixture to the pot with the sausage. Add the drained diced tomatoes, tomato puree, balsamic vinegar, 2 tablespoons of the Italian seasoning and 1 teaspoon salt. Stir to combine, bring to simmer, and then cover and set aside over low heat while you make the bechamel. To make the bechamel: Melt the tablespoon of butter in a saute pan. Once melted, whisk in the coconut milk, coconut butter, lemon juice, salt, and pepper. Bring to a simmer over medium heat whisking constantly, then set aside. To assemble the lasagna: place a layer of eggplant noodles in a 9×13 inch of similar sized baking dish. Cover the noodles with about 1/4 cup of the bechamel, followed by several full ladles of the red sauce. Repeat until all of the noodles are used up. For the final layer, place the sliced tomatoes across the top, then drizzle and remaining bechamel over the top. Sprinkle the top with the remaining 2 teaspoons of Italian seasoning. Bake for 35 minutes, or until bubbly. Let the lasagna rest for at least 15 minutes so that the juices can settle back down. Serve warm and garnished with fresh basil. Admittedly, there are hundreds of paleo cookbooks on the market, some better than others. So what do I like about this one? Cassy’s book, first of all, is based on her 4 pillars of health, helping you to gain a grasp of a well-rounded life that takes into account fitness, nutrition, and sleep, among other things. This is SUPER important because we KNOW it isn’t just about eating all the right things. The book contains 190 delicious recipes that follow a squeeky clean paleo approach. Hey, I’m not always squeeky clean, but it’s good to make the majority of your meals with these principals in mind. There’s a chapter with simple meals – 5 ingredients, 5 steps or less. That is/will be a TRUE lifesaver to anyone just starting out, getting back on track, or who leads a busy life. There are even modifications and tags to identify recipes that comply with certain special diets like GAPS, low-FODMAP, AIP, egg-free and nut-free. There’s even a 28-day meal plan, with weekly shopping list, home workouts, journal prompts, and a DIY template for those who want to design the plan themselves! This is great for those of you who need a little help changing your lifestyle and aren’t quite ready to jump right into paleo. If everything seems a bit confusing, this is the book to help un-confuse you! And LOTS of fitness help is included for those of you who want to get a little more fitness into your life without having to join a gym. This book is over 400 pages, full color, with beautiful paper. It’s absolutely beautiful and an instant classic. So, enjoy the recipe and, check out the book here!